What makes Bajaj Nomarks Ayurvedic Antimarks Exfoliating Scrub ideal is that it effectively helps remove dead skin cells and hidden impurities which are responsible for dull looking skin prone to dark spots, pimple marks, blackheads and hyper pigmentation. 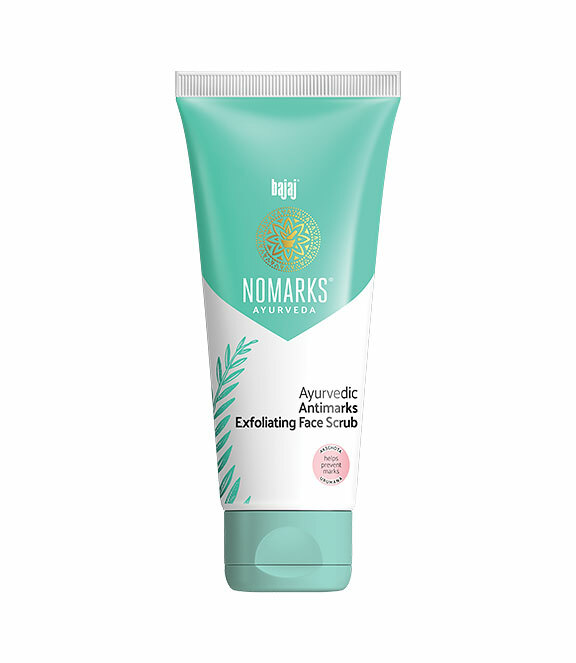 Bajaj Nomarks Ayurvedic Antimarks Exfoliating Face Scrub extracts the power of potent Ayurvedic ingredients and helps cure marks from the root of the problem through 2 steps of the advanced 4 step MARK REDUCTION ACTION. This antimarks exfoliating scrub contains Kumari (Aloe Vera) which helps provide relief to skin with marks. Bajaj Nomarks Exfoliating Scrub contains Akshchota (Granules of Walnut shell) and Urumana (Granules of Apricot Kernel) that exfoliate gently and help remove dead skin cells and impurities, to prevent further marks on skin. Take sufficient quantity of Bajaj Nomarks Ayurvedic Antimarks Exfoliating Face Scrub. Apply the scrub on a clean and wet face. Massage gently in circular movement avoiding eye area. Error: Error validating access token: Session has expired on Monday, 11-Mar-19 23:22:46 PDT. The current time is Saturday, 20-Apr-19 15:23:54 PDT.